This second novel in the Miss Peregrine's Peculiar Children series begins immediately after the first book ended, with Jacob and his new friends rowing further into the ocean and further into the great unknown world of 1940's Europe. Having escaped the dangers on the peculiar children's island by the skin of their teeth, they are forced to journey to London, the peculiar capital of the world. Along the way, they encounter new allies, a menagerie of peculiar animals, and other unexpected surprises. Jacob isn't sure if he can handle the responsibility of keeping all of his new friends safe, he still doesn't feel very special or peculiar. Only with the help of Emma Bloom, whom Jacob is beginning to fall in love with, and the rest of his new friends, will Jacob be able to find the peculiarity inside himself that he will need to deliver them all safely to their destination. Complete with dozens of newly discovered (and thoroughly mesmerizing) vintage photographs, Hollow City continues the peculiar story of Jacob Portman. Much like the first book, this is a much more dense young adult work than is popular for the genre today. I enjoy the detail and the density makes me feel as though I am part of this peculiar world and not just scratching the surface of it, like I feel in many other YA works. Riggs doesn't skip over anything we might wonder about, when I think of a question or have some kind of concern he unfailingly answers it almost immediately. I truly enjoy his writing style and the maturity of this young adult series. There are very few times, if ever, that I am angry at the characters for being blatantly immature or rash, again this is a problem I often have while reading other YA works. I also love the vintage photography that accompanies the story, which adds even more richness and depth. However, I do take issue with a couple of things in this book. The first is that I wanted more to go right for our heroes! I felt a bit stuck in bad things happening and was exhausted, feeling drained like the characters were, at every chapter's end because everything that could possibly go wrong did go wrong. I just didn't feel like this plot technique worked well in this book, I wanted a little more hope to break up the darkness that pervaded while reading. Jacob and Emma's relationship provides some relief and there are times of humor, but overall the tension never seemed to break. The second issue I have is that I am getting really sick of reading YA trilogies and series, I think more could have been resolved in this book and I'm not really excited about reading subsequent books in this series when so little went well for the characters during this book. 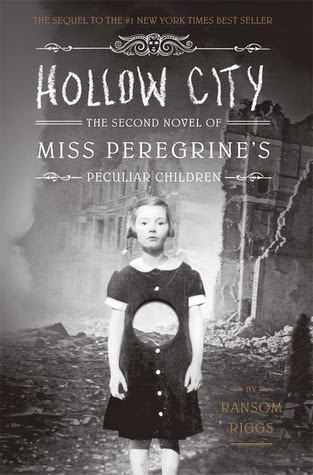 I will say that there was enough hope and intriguing events provided at the end of Hollow City that I do feel more incentive to continue than I would have if I decided not to read through to the end, or simply skimmed over things. With these issues said, I still really liked the book overall and Riggs has me hooked with his good writing and incredible world building. I can see myself reading this book, as well as the first in the series, again in the future and do plan to see these books through to the end. Somehow, even with so many unfortunate events, I do want to know what happens to Jacob and am interested to find out how Riggs resolves the puzzle he has given us. Peppermint tea is my recommendation for drinking with this book. For one thing, tea is probably the best option in general when discussing a text that takes place in 1940's Europe. Secondly, the peppermint will give you a great lingering taste that both relaxes you and helps you to remain alert while reading about dangerously horrific events. Drinking some good mint tea always makes me feel a little more optimistic.